Really exciting news – Arianna Huffington, renowned founder of Huffington Post, has launched a new venture called Thrive Global! Thrive Global’s mission is to end the epidemic of stress and burnout by offering companies and individuals sustainable, science-based solutions to enhance both well-being and performance. Recent science has shown that the pervasive belief that burnout is the price we must pay for success is a delusion. We know, instead, that when we prioritize our well-being, our decision-making, creativity and productivity improve dramatically. Thrive Global’s three interconnected core components are: corporate trainings and workshops that bring the latest strategies and tools around health and well-being to organizations; a media platform that serves as the global hub for the conversation about well-being and performance with an emphasis on action; and, an e-commerce platform that offers a curated selection of the best technology and products for well-being. Together, the three components create an integrated platform that empowers people to make sustainable changes to their daily lives, going from knowing what to do to actually doing it. Thrive Global is committed to accelerating the culture shift that allows people to reclaim their lives and move from surviving to thriving. It is an amazing site and I urge you to check it out and if you are so inclined, sign up for their newsletter. It’s helpful and healing. As we enter the holiday season, many of us will be joining family members and friends that we may not have seen in awhile. Time with family often dredges up old resentment and anger for a lot of us. And especially with the divisiveness of the past election, this holiday season may be rife with tension for many. When I think about the resentments I still carry around, I try to remember that forgiving those people I’m still angry at helps me, it’s for my own healing. But I believe a lot of us get stuck on the idea of what forgiveness actually means. Forgiveness is defined as a conscious, deliberate decision to release feelings of resentment or vengeance toward a person or group who has harmed you, regardless of whether you believe they actually deserve your forgiveness. Remember the act of forgiving is for you the forgiver, not the person you are forgiving. Forgiveness does not mean that you gloss over or deny the seriousness of an offence against you. It does not mean forgetting nor excusing what has been done. It does not mean you have to reconcile with the person or release them from legal accountability. 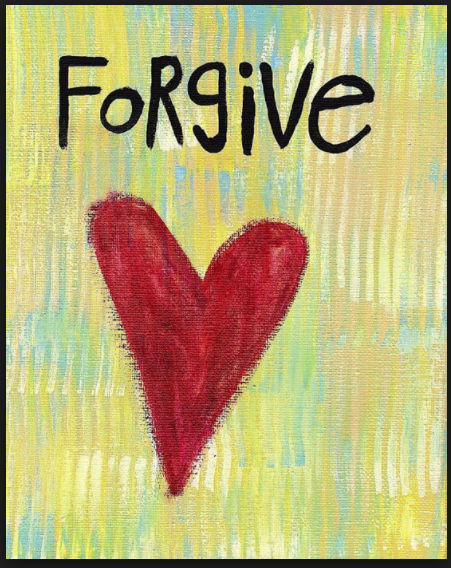 As Anne Lamott puts it: “Forgiveness means it finally becomes unimportant that you hit back. You’re done. It doesn’t necessarily mean that you want to have lunch with the person. If you keep hitting back, you stay trapped in the nightmare.” Forgiveness is for the forgiver. It brings the forgiver peace and hopefully freedom from anger. Forgiveness is, in particular, the capacity to let go, to release the suffering, the sorrows, the burdens of the pains and betrayals of the past, and instead to choose the mystery of love. Forgiveness shifts us from the small separate sense of ourselves to a capacity to renew, to let go, to live in love. 1. Understand how you feel about what happened and be able to explain why the situation is not OK. Then discuss it with someone you trust. 2. Commit to yourself to feel better; remember forgiveness is for you and no one else. 3. Remember forgiveness doesn’t mean you have to reconcile with the person who upset you; it does not condone the action. In forgiveness you are seeking peace for yourself. 4. Recognize that the distress now is coming from the hurt feelings and physical upset you are currently suffering, not from what offended you or hurt you when it happened. 5. At the moment you feel upset, practice stress management to soothe your body’s fight or flight response. Take a deep breath. 6. Stop expecting things from other people that they do not choose to give you. 7. Put your energy into looking for another way to get your positive goals met than through the experience that has hurt you. 8. Remember that living well is the best revenge. Instead of focusing on your wounded feelings, and thereby giving power over you to the person who caused you pain, look for the love, beauty, and kindness around you. Put more energy into appreciating what you have rather than attending to what you do not have. 9. Amend the way you look at your past so you remind yourself of your heroic choice to forgive. So if old resentment and anger is dredged up this holiday season, or if new frustrations and resentments emerge, remember letting go of the anger and practicing forgiveness is for your own peace of mind. Try taking a deep breath and walking away. It’s for your own good. I’d like to close with a video that I love. It is worth watching again and again. A video by Jack Kornfield called The Ancient Heart of Forgiveness. I hope you’ll take some time to watch this powerful video. I’d love to hear your thoughts about forgiveness, and how you manage to forgive those who have hurt you. And as always, thank you for taking the time to visit. I appreciate it. Very nice 360 perspective on the subject. Thank you Mark, I appreciate that. Thank you so much Heidi. I appreciate it. Namaste. Yes let’s please Feel Peace Now. https://ladyleemanilablog.wordpress.com/2017/01/09/blogger-recognition-award/ I’ve just nominated you for this award 🙂 have a great week! The ruh insani is located in the galb, the spiritual heart. The human soul is more refined than the personal soul. It is the place of compassion, faith, creativity. In one sense, the human soul includes the secret soul and the secret of secrets. It is the place of our spiritual values and experiences. Creativity and compassion first occur at this soul level. The brain, which develops in the personal soul, is like a computer, involved mainly with storage and manipulation of data, but not with the creation of new information. Creativity happens in the heart. It is unfortunate that our educational system has become so focused on the development of intellect that little attention is given to the development of the heart, which is nourished by the arts and by worship, love, and service to others. The heart intelligence of the human soul and the abstract intelligence of the personal soul complement each other. Thinking is concerned with impersonal, logical analysis. The heart adds compassion and faith. Combining the two leads to better judgment. The head knows what is most effective, while the heart knows what is right. So i forgive myself for letting my heart been hurt. Thank you so much for sharing this. Beautiful!